The accelerated degradation of a commercial LSCF/YDC/YSZ/Ni-YSZ solid oxide electrolyzer cell (La0.6Sr0.4Co0.2Fe0.8O3-δ/Y0.1CeO1.95/Y0.08Zr0.92O1.96/Ni-YSZ) contaminated by Si-containing impurities is studied with time under up to − 1.7 A cm−2 applied. Above ~ − 0.6 A cm−2, a new region appears in the polarization curve. This region corresponds to electronic conduction in the yttria-stabilized zirconia (YSZ) electrolyte, induced by the reduction under high current conditions. A shift in the typical frequencies (relaxation times) toward lower frequencies is then observed for the entire impedance spectra. This shift results finally in the disappearance of the positive loop related to the polarization resistance and the appearance of a negative (inductance type) loop which crosses the real axis (Z’) at the lowest frequencies to become positive again. This is characteristic for an electrode process mode in which the electrochemical redox reactions vanish while the cell current becomes mainly electronic due to the reduction of the YSZ electrolyte. This trend increases with time. Such a characterization of the electronic conduction of the YSZ electrolyte by electrochemical impedance spectroscopy has not been reported to date under electrolysis mode, to the best of our knowledge. Post-mortem analysis by scanning electron microscopy coupled with energy dispersive X-ray spectroscopy (SEM/EDX) shows detrimental degradation of the electrolyte after only 360 h of overall testing duration with numerous micropores in the YSZ volume, and cracks and delamination at the yttria-doped ceria (YDC)/YSZ interface. EDX analysis reveals (i) a migration of La, Sr, Co, and Fe elements from lanthanum strontium cobalt ferrite (LSCF) anode to YDC layer and YSZ electrolyte and (ii) a very important shift of Ni from Ni-YSZ cathode to YSZ and YDC, and also to LSCF anode in a lower proportion. 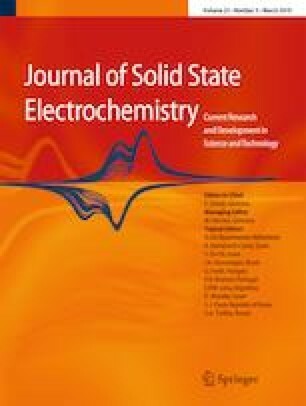 This study highlights the critical issue that impurities represent for solid oxide electrolysis cell operation. Dr. Nechache would like to warmly acknowledge Dr. Guillaume Izzet for the very helpful discussions. This work is supported by the French Research National Agency (ANR) through Hydrogène et piles à combustible program (project FIDELHYO no. ANR-09-HPAC-005).